Tropical storm Pabuk has begun pelting southern Thailand with rain and wind, in what is expected to be the worst storm to hit the region in 30 years. The storm made landfall at 12:45 local time (05:45 GMT) in the province of Nakhon Si Thammarat, the meteorological department said. 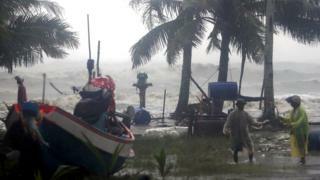 It is expected to move across southern Thailand, hitting several popular tourist spots. Thousands of people have left Koh Samui, Koh Tao and Koh Phangan islands. Tourists stranded on Koh Samui have told the BBC the island is seeing heavy rain, wind and waves and there have been short power outages so far. People also say they have been recommended to stay indoors after 16:00 until Saturday morning. While storms are common in the Gulf of Thailand at this time of year, Pabuk is thought to be the worst in decades to hit during the peak holiday season. Thailand’s meteorological department said the storm would affect the south of the country for the next few days and that “widespread rainfall, and torrential downpours are possible [in] much of the area”. “People should beware of the severe conditions that cause forest runoffs and flash floods,” the authority warned. The storm will likely weaken as it crosses over from the Gulf of Thailand to the Andaman Sea, but tourists there are also being warned to be prepared for heavy rain, rough seas and landslides.